When I was offered a chance to review the Diono Dreamliner Bassinet for WeeSpring I was thrilled. It was a company I loved making a product we needed. We like to travel with our own sleep options for the boys. We’ve been happily using the Phill & Teds Travel Cot for our two year old. (Read the review here.) We did not really have a good option for our new arrival though. At 6 weeks I was headed off to Paris with him and needed a compact sleeping option. In the past I’ve used the Baby Jogger Bassinet, which attaches to the City Select stroller. This bassinet is large and attaches/detaches from the stroller easily. It even has carrying handles It travels well, but is cumbersome to carry, particularly with other items in your hands. This makes it less than ideal for travel involving public transport. The Diono Dreamliner Bassinet fixes the travel problem. It is a comfortable bassinet that folds easily into its own travel bag. It provides a safe place for our little guy to sleep while we are traveling, without being cumbersome to transport. My traveling companion was able to carry the crib in a cross-body position, almost as if it were an oversized purse. It fit easily in the train’s overhead compartment. 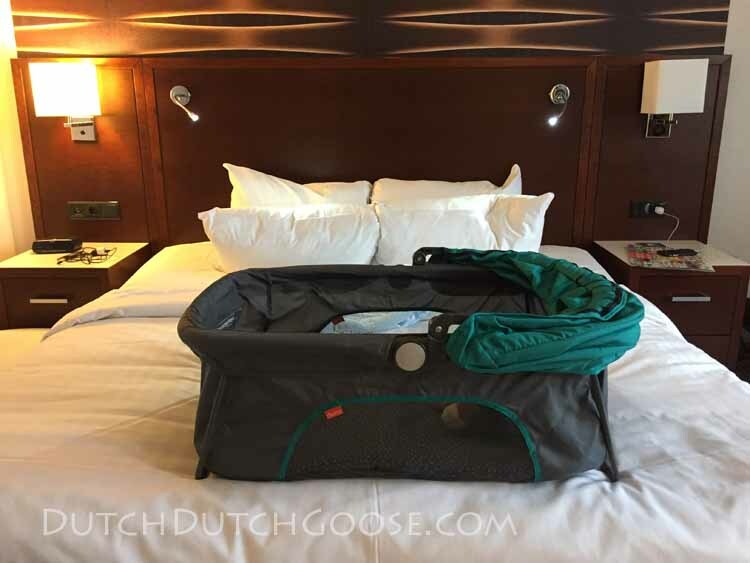 The Diono Travel Bassinet folds easily. I can pull it out and set it up in less than a minute. A huge bonus is that the bassinet comes with a removable, machine washable mattress cover! Anything machine washable with kids is a huge bonus in my book. Luckily, we haven’t needed to utilize that feature yet, but I’m sure we will. The only downside of this bassinet is that the full canopy is hard to install. I had trouble with it every time I attempted. We honestly don’t use this feature much as there isn’t much sun to worry about in the Netherlands and our primary use of the bassinet is for night time sleep. The bassinet easily pulls about half way up, but then the extended canopy is the part I have trouble with. The bassinet does have a limited use as it becomes unsuitable for children once they can move around. It’s a great option though for us, as we travel frequently with an infant. We received a Diono Dreamliner Bassinet as part of the WeeSpring Parent Panel in exchange for a review. All opinions of the product are based on our own testing. In addition this post contains affiliate links.